Humble Honeybee is my main character. She learned about humility the hard way - just like me! You can read her story in Humble Heart: A Book of Virtues. 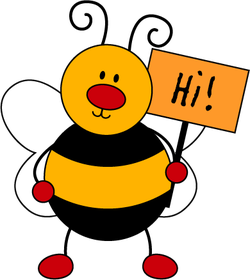 Humble Bumbles is a line of cute and colorful characters I have created to adorn products such as children’s books, baby journals, magnets and clocks. Their purpose is to spread joy and love and truth. They each have a unique personality and special characteristic. Just like me, they had to learn lessons in life the hard way but in the long run they are better for it. ​Hi! I’m Amy. I love being creative. And I love Jesus. Put those together and it makes for a pretty wonderful life. I’ve been married for over 23 years to my high school sweetheart. We’re both from Omaha, but now that he is retired from the Navy and is a full time stay-at-home Dad for our two little girls, we agreed we wanted to settle in the Southwest. We live on a mountain where I can run or hike pretty much anytime of year. I always knew I wanted to be an artist when I grew up. Right out of college I worked at an ad agency in San Diego for about two years. Then one day, our boss gave us all a pep talk and a t-shirt which said, “Don’t let fear stand in the way of your dreams.” It was so inspiring that I soon quit to follow my dreams! I decided I wanted to be like Mary Engelbreit and create my own line of characters which later came to be known as Humble Bumbles. While at the ad agency I wrote and illustrated my first children’s book, “What is it?” which is now out of print. It was published in 1999. Next came “Are there ants in your pants?” which I still have some copies of although it is also out of print. In 2001, after a really big trial in my life and a near divorce, the “Humble Bumbles Baby Journal” was published. By God’s amazing grace it has sold over 350,000 copies to date. My most recent children’s book, “Humble Heart: a book of virtues” was published by Tyndale House Publishers. It has been a long ten year journey since God first gave me the ideas for the nine characters in that book. He has taught me so many life lessons—the most important being to rely completely on Him. In the last few years I have been led into new ventures such as writing a book about how God redeemed our marriage, speaking, running a women's conference, teaching Bible study, and blogging on CBN. I’m a graphic designer as well, which I love. So many interests, so little time. I’m glad heaven is for eternity. Maybe then I’ll have time to finish my second daughter’s baby journal!